We aim to facilitate the rise of independent musicians who work outside the traditional model of multinational labels. In addition, USR is a record label composed entirely of artists, whose mission is to provide an honest, responsible and knowledgeable sales and marketing digital but also digital output for its artists in this rapidly evolving industry in which There are more possibilities every day to discover and exploit. We need entusiastic people. Young investors. We want to expand our business to the new American market. Our goal is raise $2000 dollars. With this capital we can make it grow with a big marketing campaign. 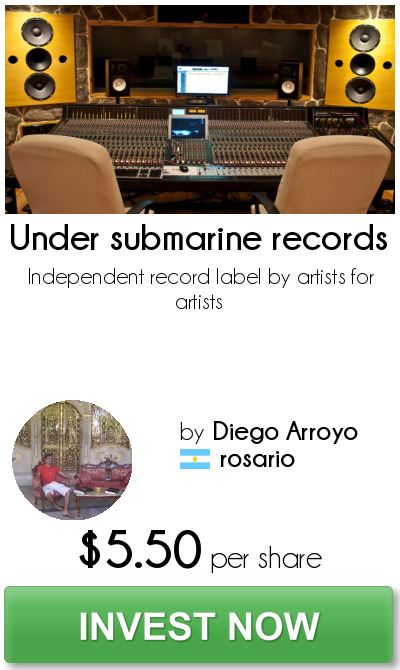 USR was born in 2012, founded by Diego Arroyo, singer-songwriter and independent producer. Our mission is to offer independent artists and labels a complete service, an alternative to the concept of a great seal. Bringing together tools and knowledge that were exclusive to the multinationals, and over the years we were fortunate to be able to acquire. USR was designed to provide services such as digital distribution, complete marketing plans, online advertising, product and content management, creative and consulting services to artists. We are aware that the market, and especially the musical, is in a radical stage of change. The digital model evolves rapidly, and mobile markets offer possibilities for artistic growth that unfortunately are not easily accessible to emerging artists. Our digital asset management platform automates administrative and distribution functions. We work with an innovative system and represent a flow of content that connects to a large selection of online services and mobile digital partners around the world. We work with 210 online music stores. And we sell music in 124 countries. If you still do not have your music on Itunes, spotify, Deezer, Google Play, etc, it's time to make yourself heard. And with the support of an independent label with more than 4 years of experience, and pioneer in digital technologies. The total number of shares, which this project is authorized to issue is nine hundred and fifty-nine (959), each with a par value of $2.00 USD.